A thatch rake might get the job done for a small plot of land, but when you’re working yourself up to the task of dethatching a stretch of lawn that takes you a lawn tractor or riding mower to tend to, you’re going to be needing something a bit more heavy-duty. Some mowers do come with dethatching attachments, but these are typically not up to the task of thoroughly and effectively removing thatch while mitigating the harm otherwise caused to growing roots and grass blades. Tow behind dethatchers are the perfect solution, attaching to your tractor or mower and letting you ride around your lawn as you dethatch passes of the grounds without needing to fork up a fortune for an electric dethatcher most likely going to collect dust in storage for the greater part of the year, or hiring professional help. 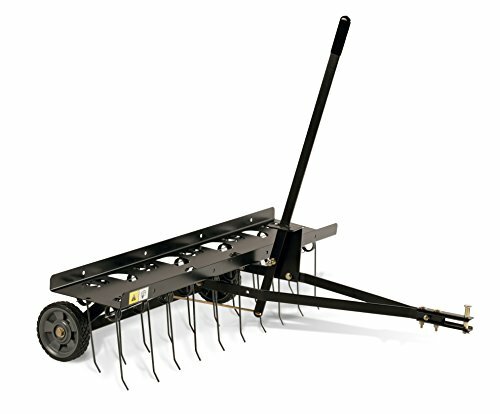 Tow behind dethatchers feature rows of wire tines which sink into the ground and rake out thatch with each straight pass of your mower or tractor, which can then be removed and disposed of, leaving your lawn ready for prep to recover from the process. Working best with short grass – so a good mowing session first preps the lawn for a thorough and effective dethatching – tow behind dethatchers literally cut down the effort you’d otherwise have to put in, either manually raking the thatch out or pushing an electric option along. Take a look at our picks for the best tow behind dethatcher. We love that this dethatcher can be used weighted and unweighted, hooking on to most tractors and riding mowers and letting you get at the stubborn thatch choking up your grass with ease. Two rows of ten wire tines each comb into the ground and scoop out hefts of thatch with ease thanks to their resilient flexibility, ready to be repurposed as mulch or removed to be disposed of, minimizing the damage which might otherwise disrupt the healthy growth of your grass while aerating the soil and enabling water, oxygen and nutrients to trickle through. To tackle more stubborn thatch problems, the unit comes with a scarify mode for a more thorough dethatching action, allowing you to adjust the desired height from the driver’s seat for the task. With each pass as wide as 40 inches, the dethatcher features a weight tray for additional weights to be added should you need them to get into really stubborn thatch, the rugged rear wheels making transporting and maneuvering the dethatcher where you need it simple and easy. The wheel engagement lever, which activates the wheels for navigating paved areas like sidewalks, is easily accessible from the driver’s seat. Lightweight and with intuitive assembly, mounting it to your mower or tractor is a simple process, making this a highly user-friendly and effective dethatcher for the DIY lawn-keeper. 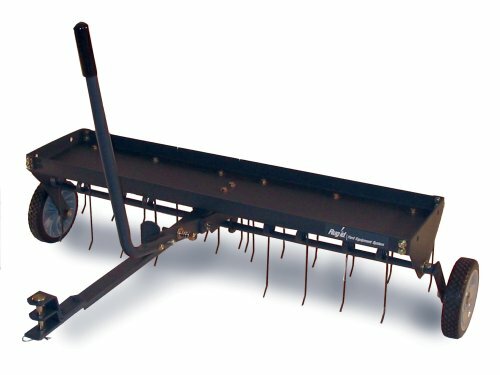 A rugged dethatcher featuring twenty spring wire tines for the maximum flexibility to comb out thatch, the unit features a weight tray with a maximum weight capacity of 70 pounds to let you get the right degree of soil penetration for reaching all the stubborn thatch accumulating under your grass. 40 inches wide, the universal hitch lets you mount the unit to most mowers and tractors to make the dethatching process a simple business of riding in straight passes from end to end of your lawn, the thatch teased out ready for collection or for being repurposed as mulch. Semi-pneumatic, rugged wheels make for easy transportation when you need to hook the dethatcher on, or are navigating surfaces like pavement (remember that all tow behind dethatchers need to be mounted with the tractor or mower on an even surface), while the cantilever handle makes raising and lowering the unit as need be an intuitive business. Rust-proof and rugged, you can count on this dethatcher to last you a very long time, holding up for those annual dethatching sessions to keep the soil of your lawn properly aerated and primed for growing healthy grass. For jobs that require a little more heavy-lifting than our budget pick can handle, here is its burlier cousin. 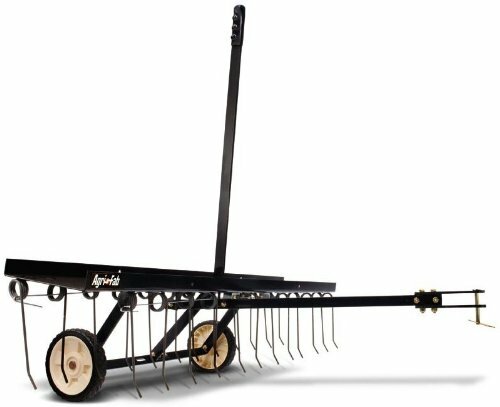 Two rows featuring 24 flexible, spring-loaded wire tines sink into the ground and comb out 48 inch wide swaths of thatch in a single pass, the weight tray capable of holding 70 pounds to let you adjust for the amount of pressure you’d need, depending on the demands of the job at hand. An intuitive cantilever transport handle makes for easy lowering and raising, and together with the semi-pneumatic, 10 inch tread tires, make maneuvering the unit where it is needed much easier. Featuring a universal hitch that lets you hook the unit up to almost any lawn tractor or riding mower, the tines of the unit are heat-treated to resist strain, with a heavy gauge steel deck and welded drawbar for rugged longevity and heavy-duty use. 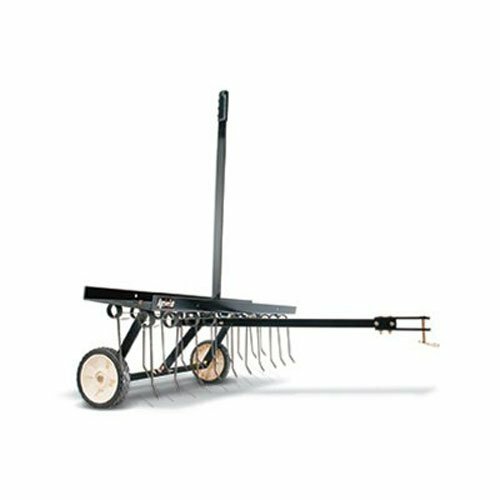 Compatible with most tractors and riding mowers thanks to the universal trailer mount, this 42 inch wide dethatcher features two rows of 11 spring loaded wire tines with 22 dethatching tips for optimum thatch removal. The universal hitch mount system can be adjusted for height to let you thoroughly dethatch your lawn, tackling the toughest jobs with its 42-inch wide swath, single lever control making for intuitive and user-friendly operation. The unit features a weight tray with a maximum capacity of 150 pounds, letting you weigh down the combing action as you need to get rid of even the thickest of thatch, aerating the soil and opening it up to allow roots to have the proper access to water and nutrients to grow healthy and recover. 8 inch diamond tread tires make maneuvering the unit in place over even surfaces a breeze.